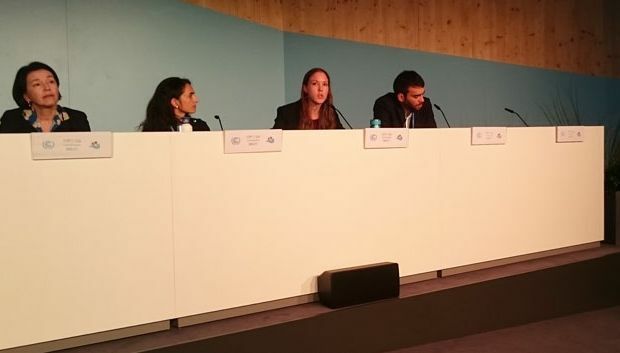 On 14 November, UNU-IAS contributed to the UN cross-agency side event Innovation and Entrepreneurship for Transformative Climate Solutions, co-organized by UNIDO and WFP, at COP23 (UN Climate Change Conference). The event brought together experts in innovative solutions to climate challenges, and offered a platform for UN system entities to discuss how multiple partners can support such innovation and applications for existing and new technologies. Lisanne Groen (Postdoctoral Fellow, UNU-IAS) participated in a panel discussion together with Derval Usher (Head, Jakarta Pulse Lab, UN Global Pulse), Katiuscia Fara (Senior Advisor on Climate Services, WFP), Joan Krajewski (General Manager, WDG Safety, Compliance & Sustainability, Microsoft), and Karim El Alami (Co-founder, Elum Energy). Based on the research findings of the UNU-IAS Low Carbon Technology Transfer (LCT) Project, Dr. Groen emphasized the importance of localizing technologies and an inclusive process for working together with local communities and governments.